The owners of this house in Tawa, New Zealand had just about given up trying to get their basement water intrusion problems sorted out. The basement of this house had been leaking for a longtime and the problems had become almost too much to handle. The owners had multiple waterproofing contractors come in and try to solve the problems, to no avail. On rainy nights, the owner said they would have to get up three to four times during the middle of the night to clean the water up with a wet-dry vacuum. They were in desperate need of a solution that works. The contractor discussed potential causes of their waterproofing problems with the homeowners. Previous waterproofing had mostly attempted to solve the issues from the inside of the basement with negative-side waterproofing practices. However, negative-side waterproofing is always difficult when a large amount of hydrostatic pressure from outside of the foundation exists. The contractor explained that a positive-side waterproofing system was their best, and really only, option. 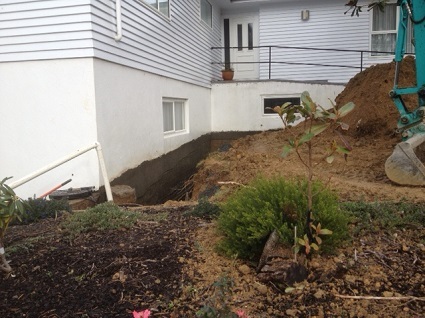 This meant that the ground around their basement must be excavated and removed in order to properly install a positive-side waterproofing system on the outside of the foundation walls. The contractor recommended the TRITOflex liquid rubber membrane as the waterproofing solution. Due to its 1900% elongation, extreme resistance to high amounts of hydrostatic water pressure, strong adherence to concrete, and high puncture resistance and durability, the homeowners wanted the best of the best product to fix their problems for the long-term. 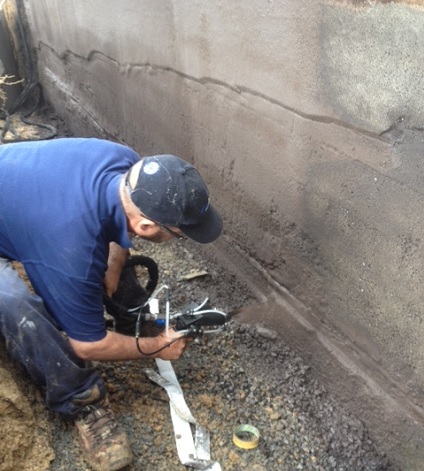 The TRITOflex liquid rubber waterproofing was quickly installed in just one coat to the basement foundation walls after the excavating, pressure washing, and priming. A drainage mat and protection course was then installed before backfilling. The exposed areas of waterproofing were coated white to match the existing color. The contractor also used TRITOflex to waterproof the concrete ramp walkway leading to the house that also was a source of water entry. Since TRITOflex is resistant to heavy foot traffic, it worked as a great waterproofing solution for this area. After TRITOflex was installed, it rained heavily for a solid week. The contractor went back after that week to follow-up and the owners smiled brightly and showed him there wasn’t a single leak.